Sales volume was up by 6 percent and the median price increased by 7 percent from a year earlier. August sales remained strong for existing, single-family homes in Maine, with sales volume up nearly 6 percent and home values up nearly 7 percent from a year earlier. According to Maine Listings, 2,072 existing Maine homes were sold in August, a 5.9 percent increase compared with August 2017. The median sale price for those homes increased by 6.8 percent from a year earlier to $220,000, it said. The median price indicates that half of the homes were sold for more money and half sold for less. Real estate agents across Maine have reported that the relative scarcity of for-sale housing inventory continues to slow prospective buyers, Gleason said. Still, sales through the first eight months of 2018 were nearly 4 percent ahead of the same period in 2017, she said. “To date, 2018 has been a banner year for real estate,” she said. 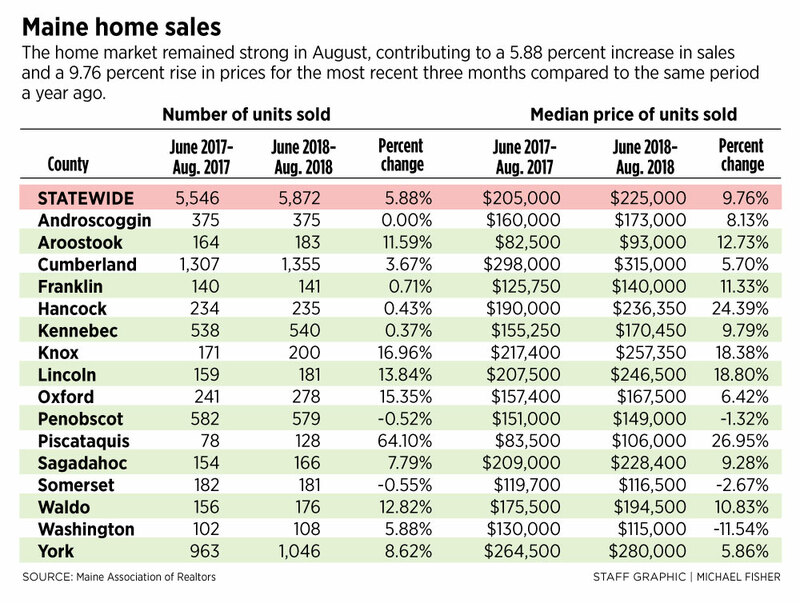 For the three-month period ending Aug. 31, home sales statewide were up by 5.9 percent from the same period of 2017, and the median sale price of $225,000 was up 9.8 percent. The biggest increase in home sales for the three-month period occurred in Piscataquis County, where sales were up by 64.1 percent from a year earlier, according to Maine Listings. Only two of Maine’s 16 counties – Penobscot and Somerset – experienced sales declines, and both were down by less than 1 percent from the same period in 2017. The biggest increase in median sale price for the three-month period also occurred in Piscataquis County, where the median price of $106,000 was up by 27 percent from a year earlier. The biggest price decrease was in Washington County, where the median sale price of $115,000 was down by 11.5 percent from the same period in 2017. Nationally, home sales were down by 1 percent in August compared with a year earlier, while the median sale price increased by 4.9 percent to $267,300, according to the National Association of Realtors. The Northeast region experienced a 2.7 percent decrease in sales, while the median price rose by 2.6 percent to $292,800, it said.